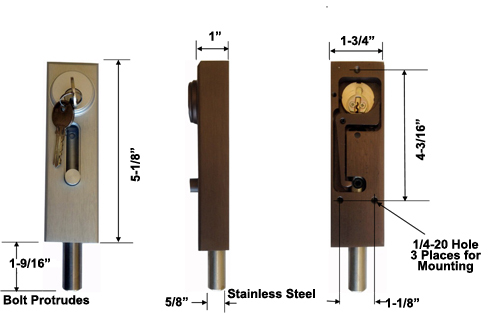 Progressive Hardware - Revolving Door Lock With Cylinder R1000 - ASK Locksmith, Inc. Originally designed for revolving doors, but suitable for many other applications. Turn key 90 degrees and stainless steel bolt drops by gravity, extends 1-9/16". Case is machined from a solid ingot of aluminum. Furnished with cylinder and two keys (Yale 1 KW). Will expect standard mortise cylinder. Available finishes are Duronodic and Satin Aluminum.